At Highland Park Fish Camp, Fishing Is A Tradition! Highland Park Fish Camp in Deland, Florida is proudly frozen in time – it’s the way “old Florida” used to be, before theme parks arrived on the landscape. In 2019, we are celebrating our 57th anniversary of the family owned fish camp, where the largemouth bass are biting year round. This rustic destination has updated conveniences over the years, but nature has been preserved. Highland Park Fish Camp is an authentic haven carved out of the wilderness and the perfect place for the fisherman, the family that loves camping and the nature lover. 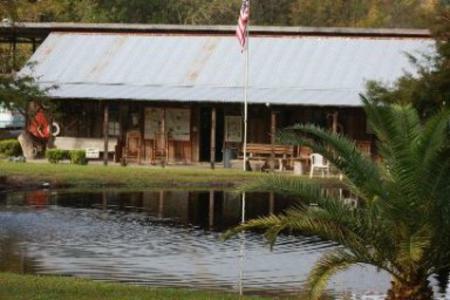 Highland Park Fish Camp is a 30 acre gem located on the Norris Dead River, a portion of the St. Johns River that is neatly situated on the boundaries of Lake Woodruff National Wildlife Refuge, a 23,000 acre preserve that has been left untouched by development. It is a nature lover’s paradise that has been left natural, unlike the growth and development of Central Florida, but only five miles from the center of historic downtown DeLand where there is plenty of unique restaurants and shops to enjoy. Watch us on How to do Florida!